F&N, the trusted companion that never fails to play an important role in the kitchens of all Malaysian households and F&B owners. It is enriched with creamy goodness in every can of F&N’s superior dairy products, F&N’s Sweetened Condensed and Evaporated Milk that enhances the taste for all savoury cooking, desserts or beverages. The F&N ‘Mesti Lip-Lap Lip-Lap Punya!’ Contest is a commitment by the household brand to create more precious treasured taste moments, connecting and bringing family and friends together. The finale started with a stunning teh tarik /pulled tea performance by F&N’s Teh Tarik King, Norazlin Bin Mat Janus whilst celebrity host of the day, Fizo Omar kept the crowd entertained well throughout the afternoon. 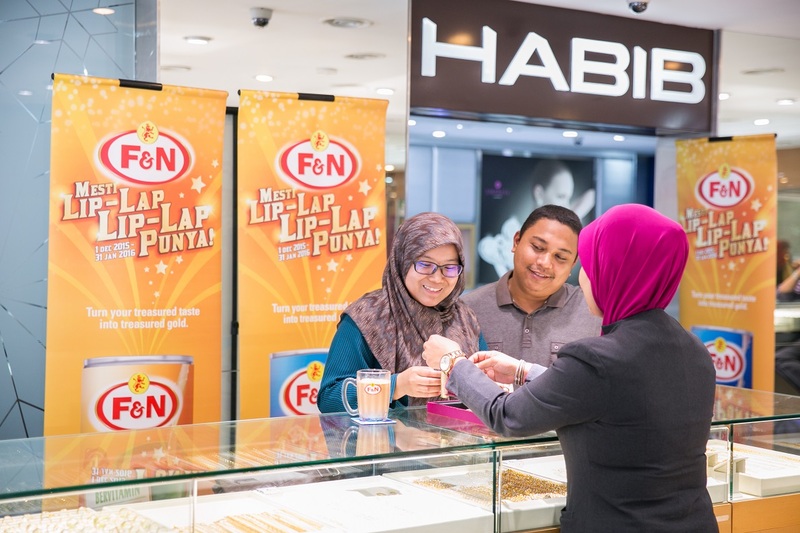 The aim for this contest was to engage with Malaysians from all walks of life and to reward them for their long standing appreciation and loyalty to F&N. Held from 1st December last year till 31st January 2016, the contest received an overwhelming response with entries from all around Malaysia. The contest came to a golden thrilling conclusion with 6 lucky finalists competing for the grand prize through the Teh Tarik and “Pick Your Fortune” challenges. Following through with their brand promise as the trusted companion for all generations, F&N commits itself to continue building trust and relationships across generations by constantly bringing treasured taste moments to Malaysians. 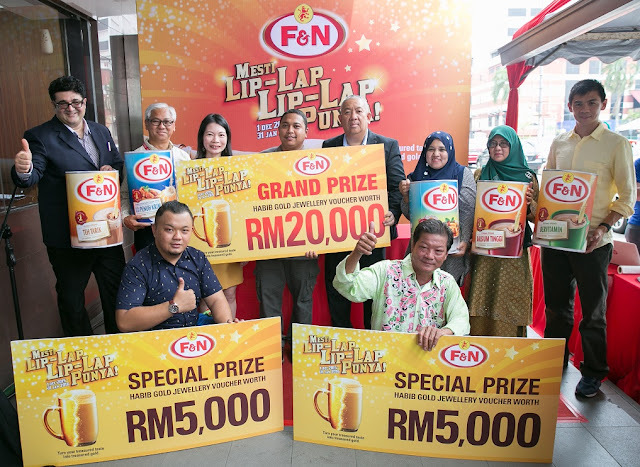 F&N ‘Mesti Lip-Lap Lip-Lap Punya!’ Contest as an initiative to continue this legacy. At F&N, everyone can enjoy a creamy and frothy glass of their all-time favourite Teh Tarik made with F&N’s sweetened condensed and evaporated milk. Then the contestants got to open their selected can. Mohd Syaufiq Bin Mat Saad (28 years old, from Alor Setar) was the luckiest among the other five finalists to bring home with the Grand Prize of HABIB gold jewellery voucher worth RM 20,000. “I am surprised to have won the Grand Prize, this is totally unexpected! Thank you F&N! Now, I am going to bring my wife and mum for some shopping at Habib Jewels really soon!” said Mohd Syaufiq who was overjoyed and brimming with pride at the grand finale. All the other five finalists also managed to walked away with RM 5,000 worth of HABIB gold jewellery voucher each. F&N’s superior dairy products are a familiar and essential part of Malaysian lifestyles and tastes. Being the preferred dairy mix to a perfect brewed cup of Teh Tarik, F&N’s Sweetened Condensed and Evaporated Milk is everyone’s trusted favourite for all occasions. wow some really got mad skills doing the teh tarik, now even got contest for that eh? LOL a teh tarik competition :-D Congratulations to all the winners. I think I will practice at home and hope to take part in the next competition :-D Thank you for sharing and inspiring.